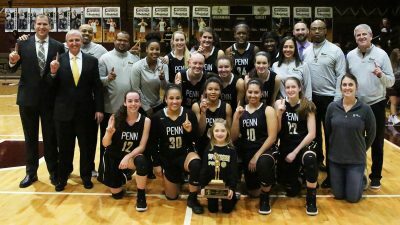 Penn’s Girls Basketball Team completed a perfect run through the regular-season, sprinting past Mishawaka, 65-24, on Friday, Jan. 24, to finish the 2018-2019 regular season with a 21-0 record. Coach Kristi Ulrich’s Kingsmen claimed the Northern Indiana Conference Championship outright by winning on Mishawaka’s court. The Kingsmen finish the NIC season with a 12-0 record, extending their NIC winning streak to 25 games. Penn earned its second consecutive NIC title and 14th in program history. Trinity Clinton powered the Kingsmen attack with 22 points. Reganne Pate hit four 3-pointers to finish with 12 points. Jordyn Smith and Kenzie Kilmer scored seven points each, and Antreese Shelton scored six points.